Collecting all the clues is no easy task—since their introduction in season two, information about the purpose and past of Dharma and the strange stations scattered around the island has been metered out in small doses. It's kind of a shock to look back and realize how much we know already, and how many questions remain to be answered (hopefully before the end of season five!). Where it all started—it's hard to believe there was a time when Lost wasn't synonymous with that ubiquitous octagonal logo. It's here that we see Dr. Marvin Candle (aka Pierre Chang, aka Edgar Halliwax, aka Mark Wickmund) narrate his first orientation video (The Swan). But before he gets into all that "push this button to avert another potentially world-ending incident" stuff, he provides a tantalizingly brief history of Dharma, founded by Gerald and Karen DeGroot as a compound where research could be conducted into "meteorology, psychology, parapsychology, zoology, [and] electromagnetism..." Hey, do you think that unexplained "incident" is what will transport the stranded-in-time castaways back to the present before the end of the season? Not only is Desmond's double-length first flashback the series' finest hour[s] to date, it also raises a lot of questions about the Swan station and the various experiments Dharma was conducting around the island. Granted, we have to trust the word of Kelvin, Desmond's predecessor in the hatch who claimed to have been recruited by Dharma after the Gulf War (he appeared in Sayid's early 1990s flashbacks in season three's One of Them), despite the fact that most of the initiative should have been rotting is a mass grave by that point. Something tells me we'll eventually learn more about why he was pushing the button and pretending the island was contaminated with lethal gas. More Dharma background from an unreliable source: One-eyed Mikhail provides a question account of his Dharma involvement (questionable because he soon admits he's pretty much a total liar), but he swears his hints about a broken truce and eventual war between Dharma and the "Hostiles" that inhabit the island are accurate. Look out for another appearance by Dr. Marvin Candle, who appears on another video that Locke stumbles across while challenging an old computer to a game of chess. This is the big one. We find out how Ben came to the island and get our first glimpse of Dharma in its heyday. Ben's dad is hired to do grunt work by Initiative bigwig Horace Goodspeed, who we meet for the first time; meanwhile Ben attends classes, during which his teachers brandish guns to fend off attacks by the Hostiles. We also witness the sad end of Horace and pals, an event that will likely have a lot more resonance now that we've gotten to know them through the eyes of Sawyer, Jin, et al. As the title implies, this one deals mostly with Jacob, but we do see Horace again: Locke encounters him twice, first as a ghostly apparition and later as a moldering corpse with a blueprint for the titular cabin in its pocket. Yet to be revealed: what connection, if any, there is between Dharma and the island's resident Wizard of Oz, Jacob. Sure, you could just read all the episode summaries on Wikipedia, but where's the fun in that? 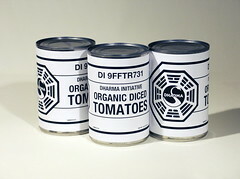 The best thing about Lost is the way later episodes inform and enrich earlier ones. And you've got to do something to make it to next Wednesday. The promisingly-titled Namaste airs March 18.